Pics and Kicks: Super Tuesday. What I consider to be LITERALLY one of the very most important books of this decade came out on paperback today. The Speed of Trust is a long overdue guide to the one thing that changes everything . . . integrity, trust. Go ahead and splurge. It'll be the best $10.20 you've spent in a long time. Covey Tells You How to Vote! Trust is the engine driving any successful government, business, economy, country, or relationship. And right now, 77% of Americans don’t believe in their leaders. How can we fix it? What do voters want? 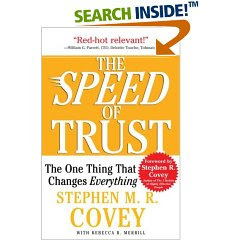 America’s CEO of Trust, Stephen M. R. Covey, knows the answers and will show you the way. According to a survey conducted by the John F. Kennedy School of Government at Harvard University, 97% of Americans agree that the next president should possess honesty and integrity, intelligence, a strong prior track record, and the ability to communicate well. Without trust and ethical behavior, communication will fail, intelligence will fall under suspicion, and honesty and integrity cannot exist. In short, the American people want and need trust! Bestselling author Stephen M. R. Covey steps in now with The Speed of Trust, a revolutionary movement designed to hold our leaders accountable for their actions and restore trust as a cornerstone of American values. In staggering numbers and across partisan lines, Americans want their next leader to hold honesty, integrity, and ethics as the highest priorities. Covey asserts that the ability to engender trust is the key leadership competency in this new, global economy. That’s where The Speed of Trust: The One Thing That Changes Everything (Simon & Schuster-Free Press; February 5, 2008; $15 Paperback) begins. The 4 Cores of Credibility — Integrity, Intent, Capabilities, and Results — are the standard against which every candidate should be measured. What is my leading candidate’s motive and intent for seeking office, and can they communicate effectively enough to work across party lines AND connect with voters? Does my leading candidate inspire confidence and have the credentials and capability to be President? Does my leading candidate have a track record of following through with their commitments and accomplishing the desired results? Can my chosen candidate behave with integrity, walk their talk, reduce divisiveness, and restore trust? Americans want to believe in their leadership and are endlessly optimistic that this great country is capable of even greater things. It’s Manifest Destiny, bred into the hearts and minds of our entire society, woven into the fabric of our lives, our plans, biggest dreams, and even entertainment. A renaissance of trust has already begun – with liberals, conservatives, and moderates alike agreeing that ethics and personal values are the new currency. Fostering trust is the solution. Wow! This sounds like a MUST READ! Thanks so much, Nat!